Now the Flash is a very fast runner. He is even faster than a very fast hummer. But then one day, to his dismay, got shot by duplicitous bummer. Intrigued? Then why don’t you have a look-see at this super fast tale, presented to you by Writer / Artists: Francis Manapul and Brian Bucceellato; and Publisher: DC Comics in December 2011. In ‘Lights Out’, we see what happens in the aftermath of an EMP device being detonated over skies of the ‘Gem Cities’, Central and Keystone, last issue. Now overall, this is a fractured tale, where: (1) The Flash saves an aeroplane from crashing. (2) Captain Cold threatens Iris West, whilst the inmates of Iron Height’s penitentiary, take advantage of this turn of events and run riot. (3) Scientist, Darwin Elias, is captured by Axel the Trickster and a some masked cronies, during his investigations of the EMP blast. And (4) Manuel recollects how he was approached by the military, and then transformed in the being that he is today. Moreover, in the latter section of this tale (which takes place on the following day), Barry and Patty go off together, to try to find Dr. Manuel Guerrero (Barry’s reproducing pal) so that he can shed some light into what is going on. However, just before they get their hands on a hand-less Manuel, his doppelgangers show up, and one of them shoots Barry. Well, for me, it is within this issues cliffhanger, when Barry muses to himself ‘I got this, piece of cake’ before he gets shot in the face. Ouch! That must of hurt. Err – you know that ‘good’ is a relative term, don’t you? Ha! Listen, I have to confess, that I did feel that this issue was a somewhat jarring thing to read overall. It started in one place, and then it drifted to another then another, before finally it found its footing again by the end of the book. Moreover, as a self-contained story goes, this adventure did come across as a collection of incidents cobbled together, and only really unified due to their relation to the EMP device exploding last issue. Still, it wasn’t that bad a read – just not a very good one. Personally speaking, I find that Francis Manapul and Brian Bucceellato work better together as artists, than they do with the written word. I did enjoy the opening sequence quite a lot, though, because it had that Frank Miller come Daredevil vibe in pace and in tone. Also, in addition to this, their rendering of a bleak Central City, did prop up the ambience of this story stylistically. I liked the first section and the last section of this comic book. The first, because of the homage and the style – and the last, because of the abrupt and brutal nature that it was executed in. As I mentioned previously, I was not too keen on the flimflamly nature of this issue – it just wasn’t my cup of tea. Plus, on top of that, the ‘desolate’ tone that the ‘Gem Cities’ faced once the EMP was set off, did come across as a mite sudden in pace, and was not really illustrated in an incremental manner – which would have added to this pieces development. Hmmmm! Let me think of something appropriate. Oh! I know! 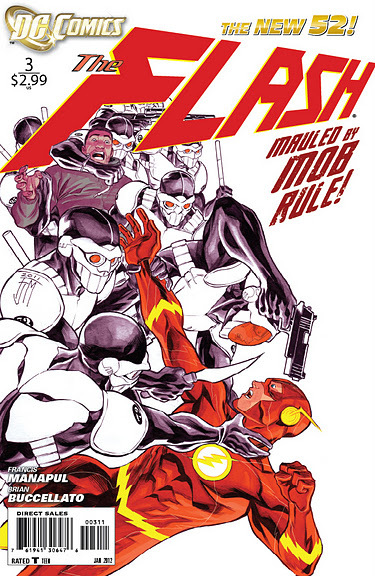 This issue of the Flash, feels like a – ‘Flash in the pan’ – pithy, yet groan worthy – snap. There is a song by old school British comedy singer, George Formby , which is light, fast, desolate in retrospect, and, at times, jarring to the ear – just like this issue. The song is called ‘Leaning on a lamppost’ – here – judge for yourself. I would have liked a much more linier story overall – a more focused plot conceptually – and a depth that this comic book does not seem to possess at the moment. Please note, I do not mean this as any disrespect to the current creative team – because I am sure that they will both be able to elevate their writing skills on the same level as their artistic ones. Presently, this Flash story arc is about something that the Flash fans do not really want to know about – thus making it a somewhat bi-polar reading experience in my mind. We want answers not stories. Where is Wally? What of Flashpoint? Why was the Iris / Barry marriage ka-put? These are questions that this arc does not give us. Instead, it gives us a headache.